On the fifth day of Christmas, Australian Bush Flower Essences gave to me… Dog Rose of the Wild Forces (Bauera sessiliflora). 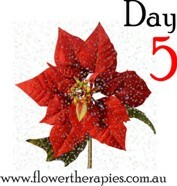 I do hope that you are enjoying this series on using the Australian Bush Flower Essences to cope with and create a better Christmas. So far we have tackled creating greater levels of enjoyment for you during Christmas, manifesting your perfect new life, releasing old resentments to better cope with family festivities and yesterday’s Essence addressed committing yourself to making real lasting changes in your life this festive season. Today we look at the issue of maintaining your own levels of calm, peace and sanity within the hectic pace of the festive season. Our chosen Essence today is Dog Rose of the Wild Forces (also a part of the Emergency Essence combination) which is very helpful for maintaining your calm ‘amidst the storm’. This Essence is incredibly powerful for creating your own sense of presence: keeping your mind still so you can consciously make positive decisions, and ensuring you don’t get ‘swept away’ in the panic that can overtake you while attempting to create the Hollywood-vision of that ‘picture-perfect’ Christmas. Despite the fact that many of us start the season planning for an easier, more restful Christmas, it can be easy to get caught-up in advertising, promotions, perfect-looking catalogues and the desire to create an unrealistic Christmas. Do you really believe that the people you see in advertising campaigns, catalogues and movies resemble a realistic family dinner-scene? Do you really think there are many people who are actually able to put together a Christmas like that, without having an entire household staff at their beck and call? We are often misled by all the images we are presented with, but most often by our own sense of unreasonable obligation which can make us attempt to achieve unrealistic visions for our family and loved ones. Keeping your cool: You’ve probably heard good therapists say that you shouldn’t take it personally if the weather chooses to rain on your wedding day! With Christmas often being a highlight of many people’s social calendars, any hiccup that interrupts the smooth course of events can easily lead to you lose your cool and nearly give up on everything. So what if the turkey didn’t defrost in time, or you forgot to buy the custard for the pudding? Do you really think your guests will leave miserable and thinking what a rotten host you are? Of course, if you throw a small-scale temper-tantrum, you are very likely to leave that exact impression on your guests! Dog Rose of the Wild Forces Essence can help you instead maintain a sense of calm and cool in the face of any ‘bump in the road’ and can help you to become the King or Queen of clever improvisation when things don’t travel quite as you’d expected. And if your past experience is anything like mine, those times when you are forced to improvise usually leave you and your guests with the best memories. Creating a greater sense of calm: Dog Rose of the Wild Forces Essence can help you to create a level of calm and have you working like clockwork, so much so that your family and guests will think you are truly unflappable! During times of frantic activity, you can be forgiven for thinking the universe is throwing every possible obstacle your way: whether it be your kids loudly complaining about the batteries you forgot to buy for their new toys; your family getting in your way and telling you how things should be done; or your phone constantly ringing off the hook causing you to burn the sauce you had gently simmering on the stove. Dog Rose of the Wild Forces Essence can help you to realise that random ‘stuff’ just happens, and the best way to handle it is to go with the flow, maintain your calm and hold your resolve to stay happy no matter what. Maintaining your sanity when facing harsh deadlines: Some of the things we attempt to do at Christmas could lead an outside observer to think that maybe we are all just a little bit crazy at this time of year! Let’s look at a scenario that just may resemble one of your own past Christmas experiences: Your 9-year old son comes home the night before his school’s Christmas Eve play and tells you for the first time that he needs to have a shepherd costume ready for tomorrow evening; your 15-year old daughter tells you she is traveling away with her friends from Christmas Eve through to Boxing Day despite your loud protests; and your partner tells you that you have to attend their work function – you guessed it – also on Christmas Eve, which now means you will have to leave your son’s play 30 minutes before it ends in order to attend the work party, and ensure you get home in time to get the next day’s banquet prepared and stop your daughter from jet setting off to wherever she is not supposed to be heading. Arrgghh! As I pointed out earlier, Dog Rose of the Wild Forces will help you to maintain your calm, but it will also help you to maintain your own clear-line of thinking so you will be able to deal with all scenarios that may arise and will help you to sort through what you can achieve and what you can’t. Most importantly, it will ensure you don’t get caught up in the hysteria of those around you who may have left their obligations until the last minute! Above all else, Dog Rose of the Wild Forces Essence can help you to avoid the feeling that you are going to lose your sense of sanity this festive season and will help you maintain your own sense of presence amidst any turbulence. The easiest way to use this Essence is within the Emergency Essence combination so ensure that wherever you are or whatever you are doing this Christmas, you have plenty of Emergency Essence or Dog Rose of the Wild Forces Essence on hand! Remember to check back tomorrow as we continue forward onto the sixth day of Christmas Essences (subscribe here to make sure you don’t forget the rest of the series! ).